The material requirements page shows you raw material requirements to cover your sales orders or production orders for a given season. By adjusting the filters you can view the total quantities, costs and supplier details for all of your required raw materials. You can also choose to filter by season or see quantities required for all seasons. 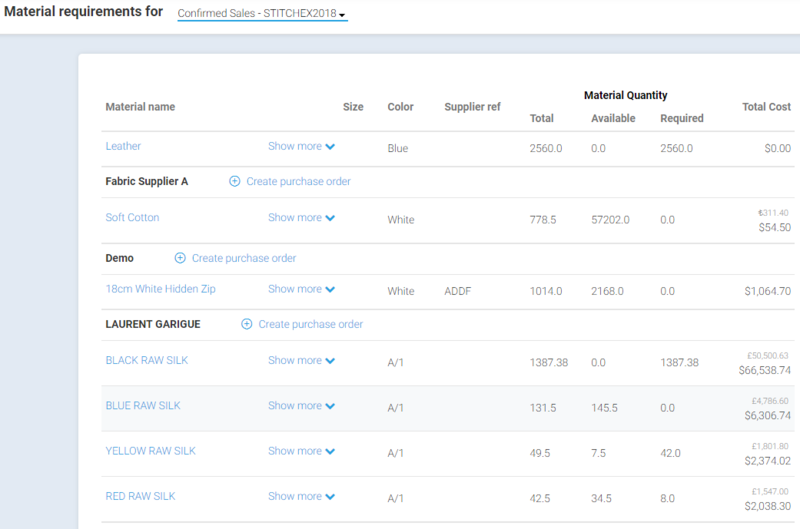 Click on the "Show More" drop down arrows to see what products these Materials are associated with, your product identifier, color, product quantity and total material quantity. You can export your filtered data using the "Download CSV" links at the bottom of the page. To download an Excel compatible CSV file, use the "Excel" download links. Manage Material Name Changes - Learn what to do if you have a material name change.